There have probably never been more factors at play in the UK property market than there are right now. The national market is pausing for breath as it reaches the end of the cycle which started with the credit crunch. 2016 saw stamp duty changes as well as the Brexit vote, and the impact is very much still being felt. The result of the election has added to the uncertainty surrounding the economy. Now that Brexit negotiations are getting properly underway, it will be interesting to see if there is any direct effect it has on the market. Since the original vote, interest rates were dropped to 0.25 per cent to support the economy. This has resulted in property prices rising nationally by 7.2 per cent – and we expect them to grow by a further 6.6 per cent over the next 12 months. So why are we so bullish about the market in Walton on Thames and Hersham? 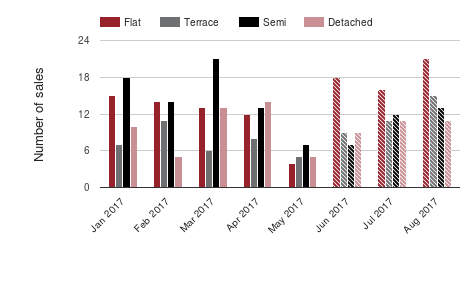 Well the data shows us that in the second half of 2016, sales levels were 6 per cent lower than the first half, but this becomes positive when we strip out the impact of the stamp duty rise. Based on market trends, we expect the price of the average home here to reach £636,900 by the end of 2018. Projecting future price trends is never straightforward. The construction of new homes impacts on this heavily; residential developments will often increase the value of other properties in the area due to the way valuers use ‘comparables’. Other important aspects they consider when determining the future value of property are upgrades to travel networks and new businesses opening in the area. Rising property prices mean some people will decide against hopping on the property ladder, instead choosing to rent. Rents have also seen increases, but usually at slower rates than property prices. Landlords tend to focus on the yields when it comes to renting a property: the current gross yield in the local area is 0 per cent. This chart takes a look at how sales levels have evolved over the last eight months in the local area. It should be noted that we’re looking at a relatively tight area over short periods of time, which is why there is a lot of volatility in the figures. The patterns however, are very revealing and show how seasonality affects the dynamics of the market. It is hard to gauge actual property price movements without having something to compare them against. 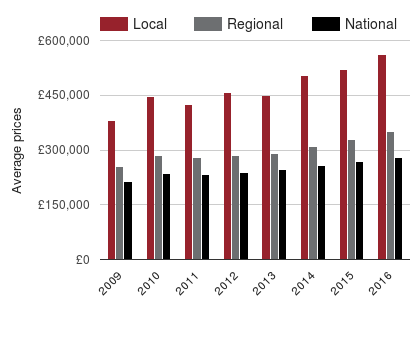 The chart shows the price differences in our area compared to the wider region and the rest of England and Wales for the last eight years. 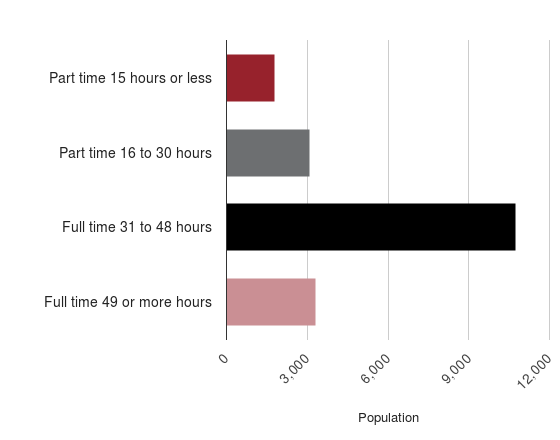 Areas which are home to residents who work long hours tend to have something of a split personality. The people you might see on the street on weekdays are often very different to those at weekends. The crucial benchmark is 49 hours per week. If you’re working that many hours or more, remember no one on their death bed ever wished they’d spent more time in the office! The future looks bright for the local property market; now is the time to think about getting on it if you’re not already, especially while interest rates remain so low. 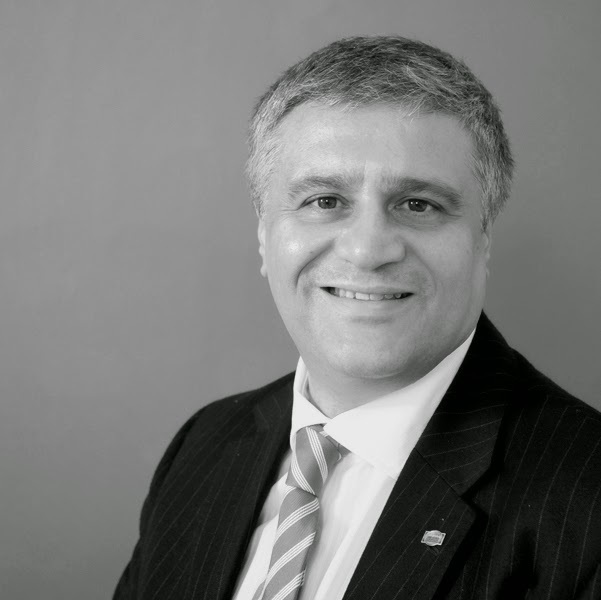 If you would like to sell your property, pop into our office for a friendly chat with one of our local experts. We’d love to help. Alternatively, find us on social media and join the Walton Property Community Group on Facebook for local property market updates and free property advice.